Online registration closes Tuesday, June 14th (end of day, local time for respective registration websites). After the cut-off, only on-site registration will be available. Attendee items/souvenirs (e.g., shirts) for on-site registrants may be limited or unavailable if there are too many last-minute registrations. option is a registration site based out of Korea; this will charge you in South Korean Won, which should be easier for local/regional attendees. 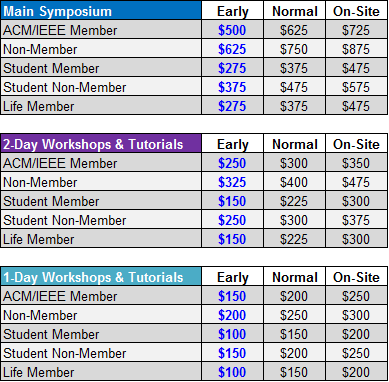 RegOnline (US-based, charges in USD as per the table below). 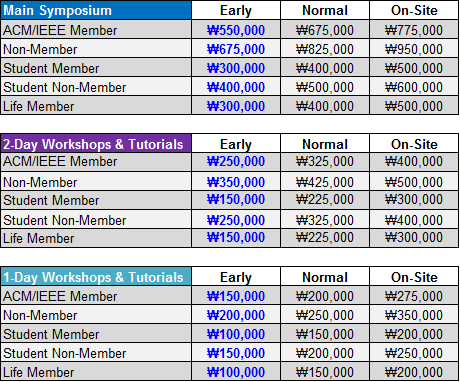 isca2016.onpcs.com (Korea-based, charges in KRW as per the table below). 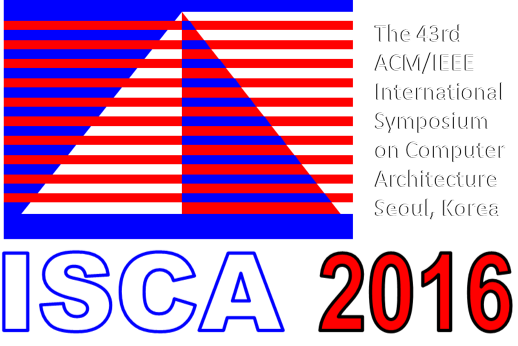 Due to the delay in getting the Korea-based registration website up, we have extended the early registration deadline to May 31st, 2016. Current exchange rates can be found at, for example, www.xe.com. Please Note: The USD registration rates end up slightly higher than the KRW rates. This is due to a combination of conversion with a conservative exchange rate (to protect the conference from fluctuations in the exchange rate) and to cover additional costs to wire the funds internationally from the US-based RegOnline system to South Korea. If you wish to get the absolute lowest rate, register directly through the Korea-based registration page when it becomes available.